Crossroads was taken in June 2017, at Saint Patrick's Cathedral in Manhattan. [I used my Canon 5D Mark IV camera. f/2.8 - 1/125 sec. - ISO 10000 - focal length 50mm.] 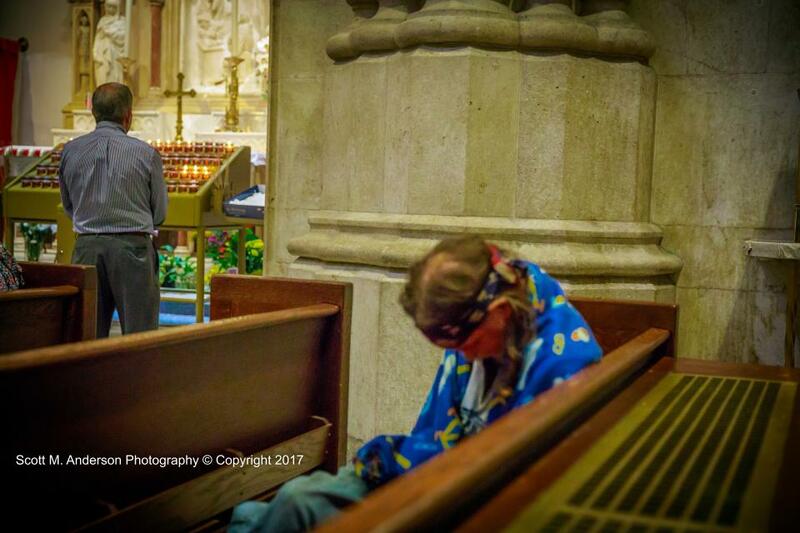 I was captured by the two gentlemen in the cathedral, with the cross near as well. I saw the human element, two human beings, the journey that all of us take, down the crossroads of life. Seemingly in search of the same answers, and yet many of us have such different outcomes, answers, results. We search for the sacred, the word of our Lord or God, devote our lives and actions to our religions.....yet a simple reaching out, of human connection, seems difficult. I found this as a moment of grace in time, in our routines. It certainly was screaming in silence at me.